More than just a stock. This soup base is fantastic. I believe I have the best soup base recipe I know. I am always getting compliments on my version of stock. The secret to this stock will be revealed below. I am writing this recipe in February. The coldest day in Canada. We recently reached the record breaking temperature of -25C ( -13F ) and -40C (- 40F ) with the wind chill. What’s for dinner? The first thing that came to mind is piping hot soup. When you think about comfort food, many thoughts fill your head. Right now. I am thinking about warm and comforting soup. Chicken soup is the first one that I think about when I feel chilly and want to ward off those bitter cold winds outside. 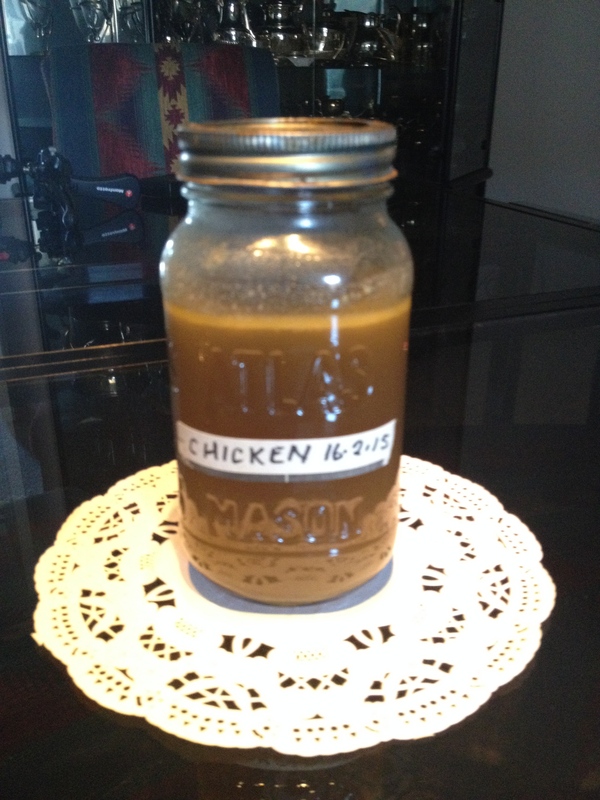 To have great chicken soup, you must have a GREAT CHICKEN STOCK. Throughout the years, I know that if I have a good stock base my soups taste fantastic. The secret to the best soups is in the stock. Whether you use the carcass of that store bought grilled chicken (don’t throw this out). Freeze the chicken carcass, if you have no time to cook right away. Or, use a raw chicken carcass. 1. In a large pot place your chicken and vegetables. 2. Add water: enough to cover all the ingredients. 6. Simmer stock until it is reduced by half the volume. Now you are ready to prepare your “SOUP OF THE DAY“. Make enough stock to store in the freezer . Most of the flavour comes from the bones. You don’t really have to add any herbs and spices. Sometimes, when I am so busy I forget to add the fresh thyme. (a little pun) The veggies will provide an aromatic flavour on their own. “FRESH” Herb list: Parsley, sage, rosemary, cilantro, oregano and thyme. Fresh herbs taste very different than the dried version. Your prepared soup recipe will have added spices and herbs. Either way it’s all to taste! Soup stock aficionados maintain that celery, celery leaves or celery seeds are the most important addition to your stock. Celery seeds are great to have on hand. Open the seeds up with a mortar and pestle to add savory to just about any dish. I add a tsp of fresh, ground celery seed to my chicken soup. FOOD TIP: Use almost any ( mild ) vegetables you have handy for your stock; not just freshly cut carrots, celery and onions. I just put in the woody ends of my asparagus. I also added the leafy portion and well as the thick stem of the celery. Use the center core of your cauliflower and peelings from broccoli. Most people won’t eat these so don’t throw them out. Do not add strong vegetables such as beets and turnips. You can also brown your raw chicken carcass to get more flavour. When ever you are preparing vegetables for a meal, make it a habit to throw your clean scrapings into a container and store in the frig or freezer for your stock making day. After you cook the stock for an hour or two, strain the stock. Put the stock back in a pot and reduce it by half. (This is the real secret ) This will concentrate the flavour and sometimes I do not even have to add salt to a soup when I have used this double rich stock. The health benefits are tremendous as well. This stock is LIQUID GOLD! HEALTH BENEFITS: The wing is the best part of the carcass of the chicken. It provides the best gelatin, (natural collagen ) formed in the cartilage that aids in building your immune system ( fights colds ). You can tell if your stock has good gelatin content if it gels after cooling. My mom used to use her stock for “Chicken Jelly” when I was a kid. I kept asking her to make it a lot, not knowing you had to prepare the stock. I was 8 yrs old. Still one of my favorite dishes!